Gone are the days of plain rectangular cakes with a few fancy details. In order to keep up with the extravagant cakes you see on television and in major cake shops, you’ve got to go above and beyond a regular sheet cake. Pantastic Pans are plastic pans you can bake in. Yes! They are FDA approved for food use and when placed on a shiny cookie sheet, can be baked in directly in your oven! These pans are especially great for a beginning baker who wants to make something more exciting than a flat, square cake. Until I started working at CK Products in January, I didn’t do a lot of baking. 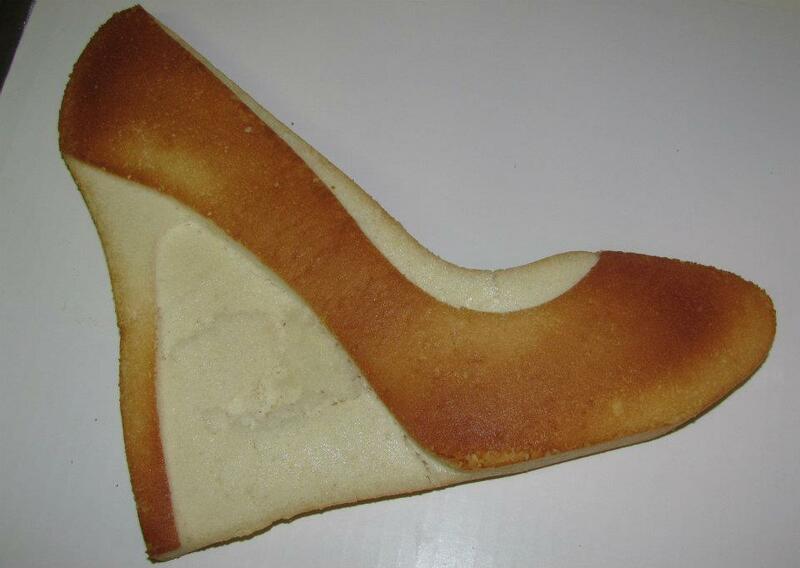 So when my best friend said she wanted a stiletto cake for her 25th birthday, I was horrified. How in the world was I going to make a cake like that? 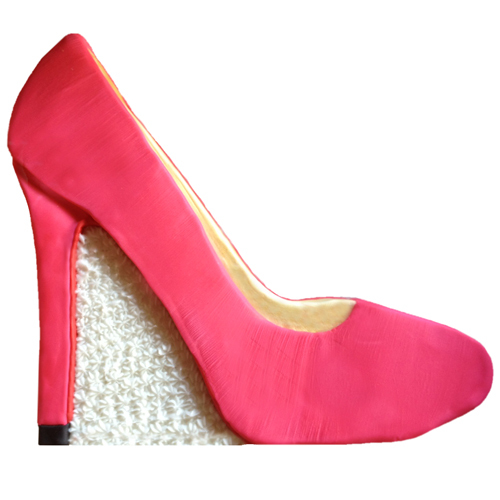 The Stiletto Shoe Pantastic Pan was my answer. Each pan holds approximately one cake mix and should be baked at 325 degrees F. I whipped up some white cake, poured it in the stiletto shoe pan, placed it on a shiny cookie sheet and baked the cake. After it cooled, I flipped it over and popped it out of the pan. 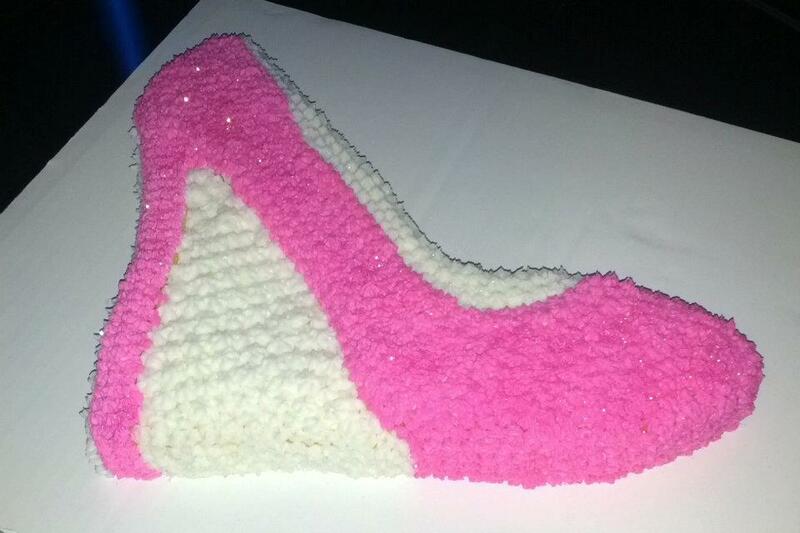 There it was – a perfect stiletto shoe cake! I froze the cake overnight so it would be easier to decorate the next day. Saturday morning I crumb-coated the frozen cake with white buttercream icing. Then, it was time to decorate! The cake my boss made in the pan when it first came out was decorated beautifully. It was covered in silky fondant and had great detail, as you see pictured at left. Still not comfortable with fondant (ok, I’ll be honest- I haven’t even attempted it yet! ), I decided to do the entire cake in star tip using buttercream icing. I was nervous about what my best friend would think of the star-tipped cake. Luckily, she loved it so much that she wouldn’t let anyone eat it until her family party a few days later! I worried that by then the cake wouldn’t taste as good, but she said it was absolutely delicious, and that her family loved how it looked AND how it tasted! I’ve made a few Pantastic Pan cakes since then, and each has turned out great. Not only are the pans safe to bake in, come in fun shapes and make decorating easy, but they are also a fraction of the price you would pay for a regular cake pan. CK Products also has NFL and MLB Pantastic Pans! Have you ever made a Pantastic Pan cake? How did it turn out?